We spent the night at Punakaiki and then continued on our journey. The next destination was Lake Wanaka and this single tree that grows in the lake. I spent some time photographing sunset and then sunrise the next morning, but unfortunately the light wasn’t that great. I may end up posting a couple images from that location but I’m not sure they are worth showing! We hoped for better luck as we headed toward Franz Josef Glacier, but while driving closer, it began to rain. By the time we reached the little town-site, it was a full on downpour. I guess that happens a lot when you’re in a temperate rain-forest. We decided to press on, and made the long drive to Milford Sound. That decision turned out to be a fairly good one as it provided me with some more time to explore the area, and surprisingly, the light was a lot more interesting. During our time there it was never fully clouded over, which is a rare thing according to the people we met there. The four vertical photos were all taken within an hour of each other. There were a lot of different ways to compose images here, and in the end I chose this gnarled tree and some patterns in the sand farther to the right of the first two photos. I “pre-visualized” the tree photos in both colour, and black and white. 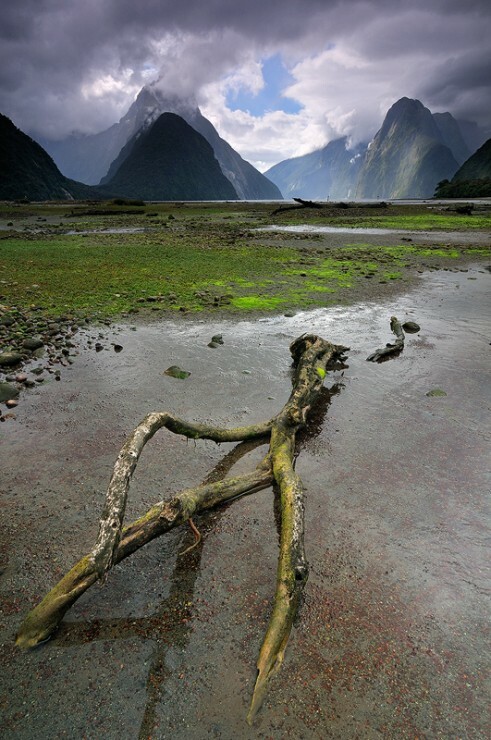 “Afternoon with Mitre Peak” Milford Sound, New Zealand. 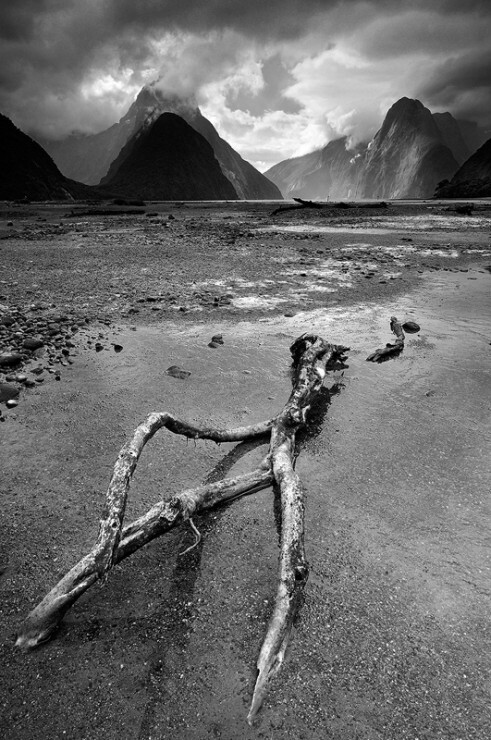 “Afternoon with Mitre Peak B+W” Milford Sound, New Zealand. With the sand pattern photos, I knew I wanted to do only black and white with these images. There wasn’t much colour to work with but there was some great texture in the sand, and the light coming through the clouds helped a lot as well. 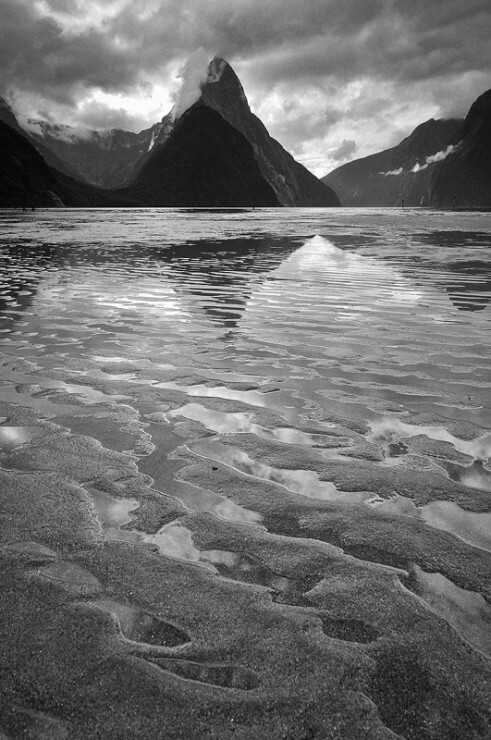 “Ripples” Milford Sound, New Zealand. The last image was taken four hours later after the sun had been down for a while. Sunset didn’t provide much colour as there were no clouds in the sky and the sun was in the wrong position to illuminate the peaks. But the last glow of light provided to be quite interesting and once again, I decided to shoot this photo for black and white. “The Sound at Dusk” Milford Sound, New Zealand. 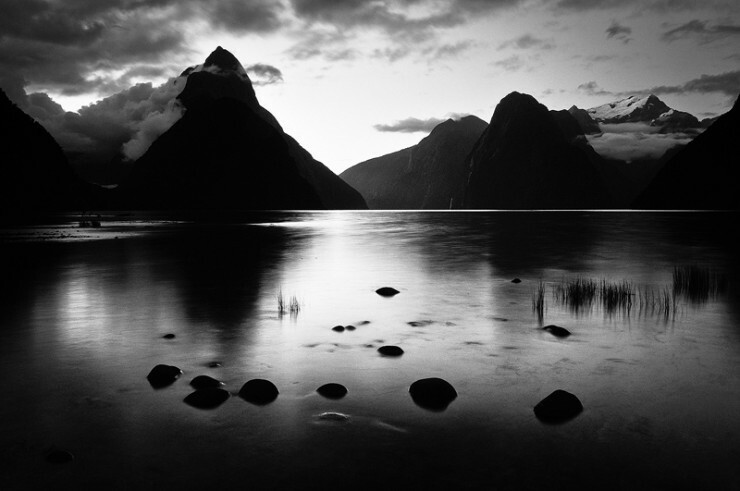 Written by Mike Isaak, posted on May 2, 2013 at 5:30 pm, in New Zealand and tagged black and white, milford sound, new zealand, night photography, sunset. Permalink. RSS feed for this post.